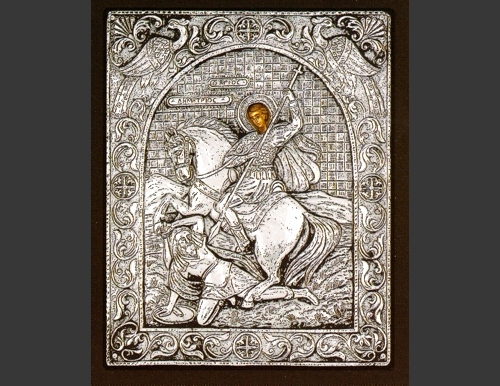 An exquisite silver Greek Orthodox icon of St. Demetrius. 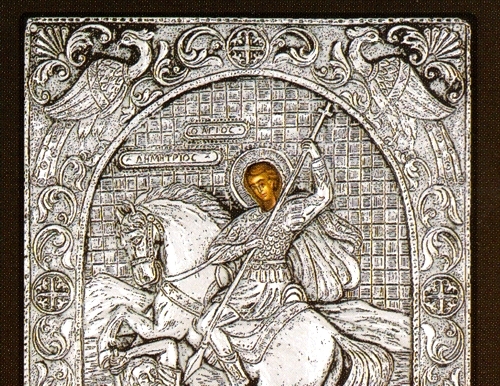 St. Demetrius is one of the most popular saints in the Orthodox world. He was martyred around the year 306 in Thessalonica, and his cult rapidly grew during the Middle Ages, when he was regarded as the first recognized as the patron and protector of the city, militarily as well as spiritually. His feast day is celebrated on October 26. Made of 950o proof silver on a selected timber frame with the painted parts of the icon painted by hand. Exact reproduction of an antique Byzantine masterpiece. The icon can be 24K gold plated upon request with a small extra charge. There is a wide variety of additional silver icons available. Please contact us for more information.